Summer is winding down (sure it is October, but this is Houston…summer goes all the way to November sometimes) and the summer produce is really at its peak (and it’s cheapest). Even the run-of-the-mill supermarket tomatoes are very good this time of year. They are sweet and with the right balance of acidity. The red bell peppers are large, plump and -at $0.50 a piece- a bargain. 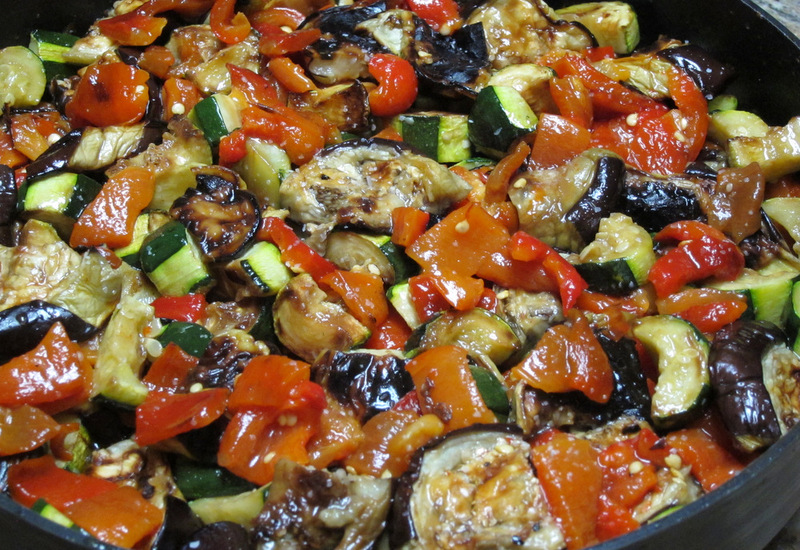 One of my favorite summer dishes that I love to make around this time of year is a good Ratatouille. 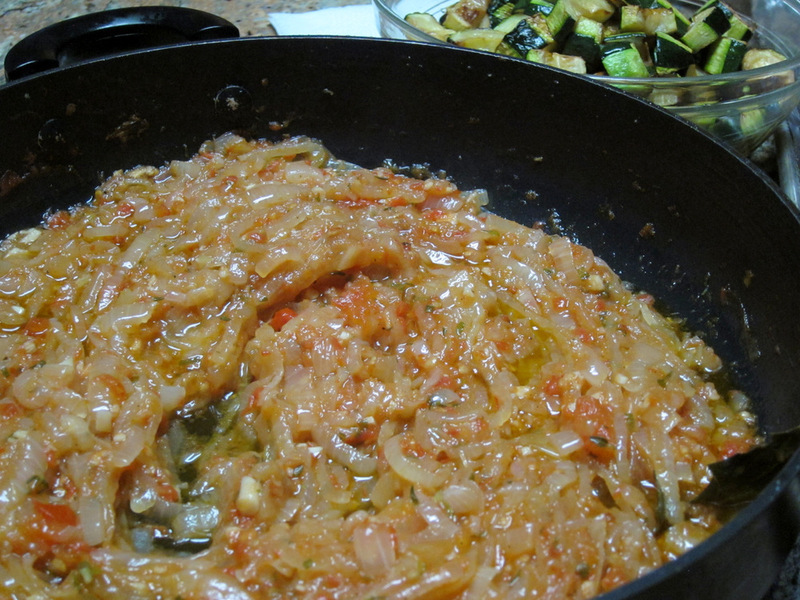 It’s a simple stew of tomatoes, sweet peppers, onions and eggplants (sometimes zucchini goes in there too). 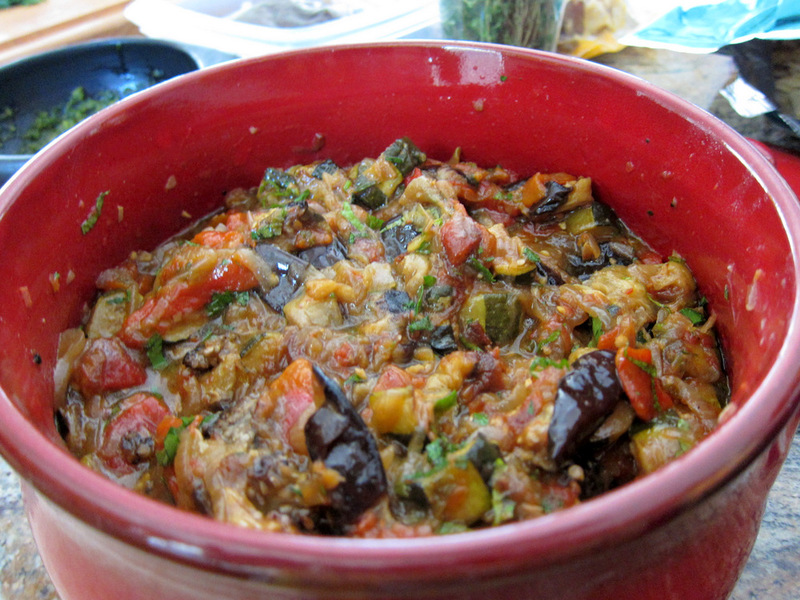 Versions of this delicious Provencal vegetable stew are numerous and they vary from very straightforward (saute all the veggies together) to the more elaborate (cook each vegetable separately, combine afterwards,…). This recipe is decidedly in the more elaborate camp, but it really is a pleasure to make in a few stages and I enjoy the process and love the amazing results. It is so good that I have not made another version in years. Cooking all the vegetables together in one pot really does not give each type a chance to shine. Instead you get a homogeneous mishmash of vegetables. Not necessarily a horrible thing, but usually not what I am after. 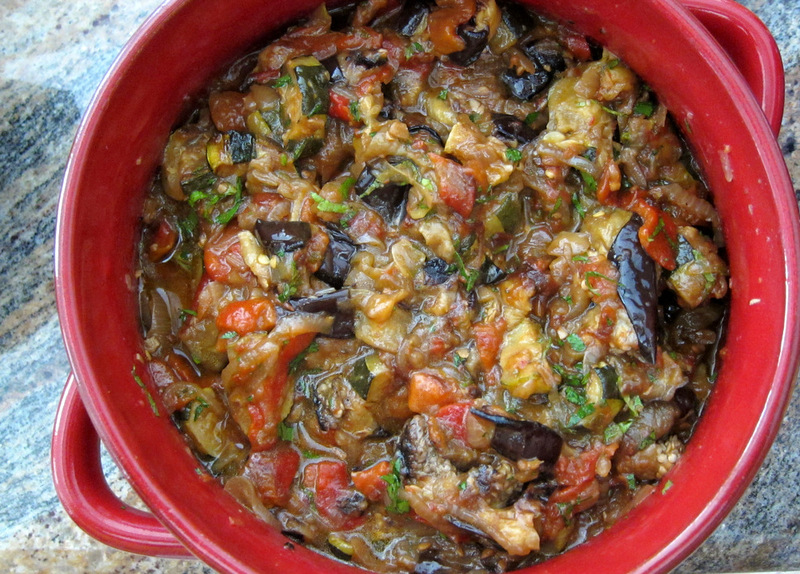 The recipe I use every time is based on one from Paula Wolfert’s Mediterranean Grains and Greens book that she titles “Madame Saucourt’s Fabulous Ratatouille”. I still need to get around to trying Francis Lam’s Weapon Grade Ratatouille just to see if that name is apt! Lam describes his version that takes hours to cook as roasted vegetables bound together by reduced tomato juice/jam and onions. Sounds excellent. 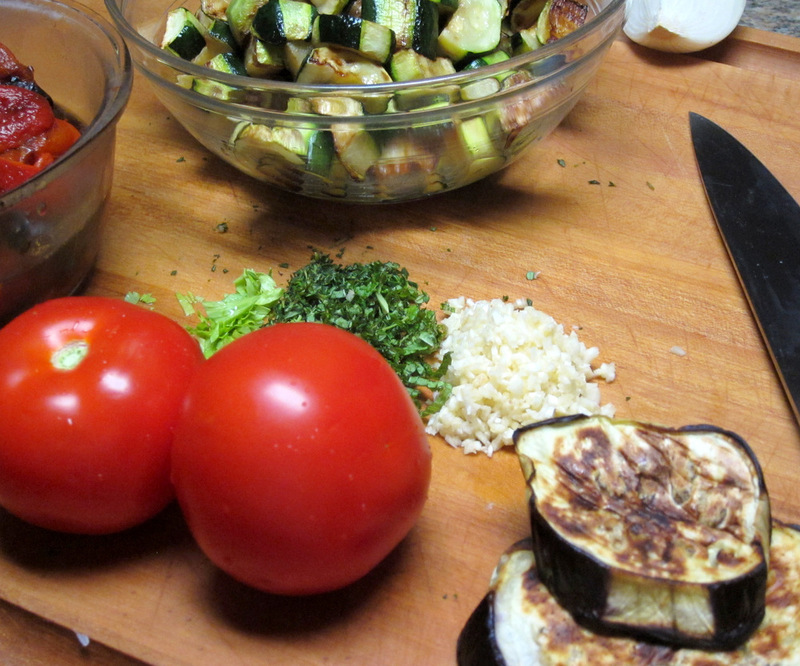 The only shortcut I take in my version is for the zucchini and eggplant. 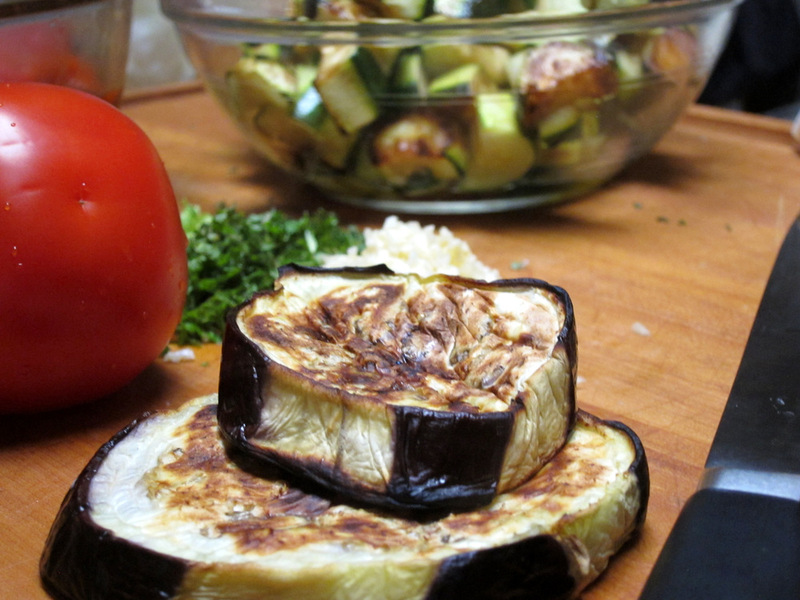 Instead of deep frying, I cut the eggplant into thick rounds, brush them with oil and broil them or grill them (after salting, draining and drying). To prepare the zucchini I cut them into large cubes and then pan fry them in olive oil until golden on all sides. The original recipe makes a large amount, something like a gallon or so. I usually make half of that and it is enough for a large meal and several small ones throughout the week. To bring it all together the onions are cooked long and slow in plenty of olive oil and some water until soft and golden. Then we add garlic and herbs (thyme, rosemary, parsley, bay leaves, celery leaves) along with a healthy dose of white wine. The mixture is cooked for some more time before adding the pureed tomatoes. The flavor building keeps going for another hour or more with the mixture bubbling and reducing. Now we assemble the Ratatouille. I use a pretty clay pot I have (one of many) to layer the tomato mixture first then the prepared zucchini, eggplant and peppers. I add in another dose of white wine and the whole thing simmers gently for another hour or two making sure it does not burn or stick. 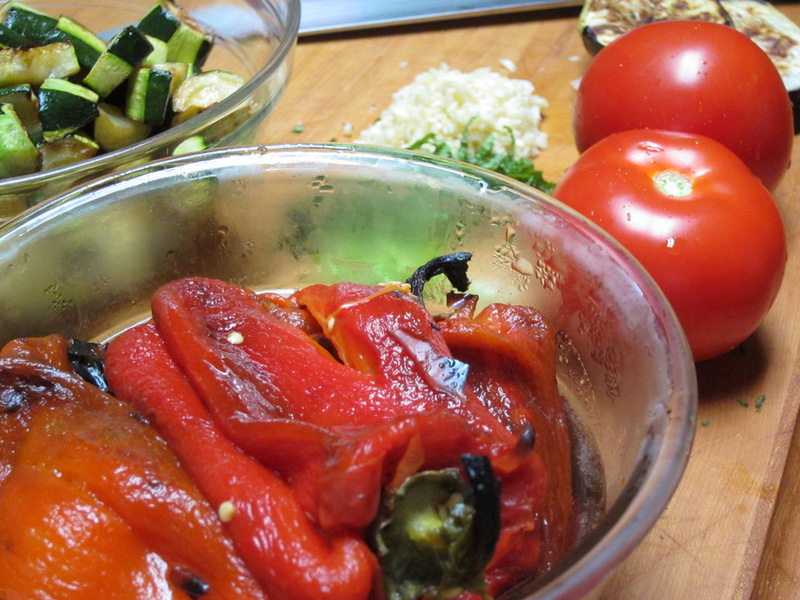 If the Ratatouille has too much liquid, I gently drain as much of it as possible and reduce it separately. A final adjustment of some red wine vinegar if needed and a fresh sprinkling of herbs round out the dish. This is delicious warm or at room temperature. I love it with crusty bread and I’ve been known to enjoy it with steamed burghul or even pita bread.